When trying to entice a publication to consider purchasing gruesome photos of the charred remains of a deranged murderer, the initial approach is crucial. That unsolicited offer was sent to TSG this week by “James,” a Los Angeles man who would like to sell six post-autopsy photos of Dorner, the cop killer who was incinerated earlier this month inside a cabin in Big Bear, California. The photos were not taken by law enforcement officers or coroner’s personnel. No, “James” snapped these treasures himself with his iPhone. 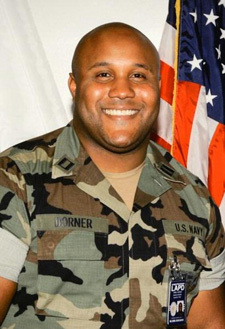 He accomplished this photographic coup thanks to a friend who works for the mortuary to which Dorner’s body was released by investigators. “James” photographed the body bag in which Dorner’s remains were placed, and made sure to get a close-up shot of a tag containing the coroner’s case number. He then opened the body bag and got the money shots of the former LAPD cop, whose body was so burned beyond recognition that he had to be identified through dental records. Sadly--for “James,” at least--he has had difficulty locating a buyer. Two leading practitioners of checkbook journalism, the National Enquirer and the gossip web site TMZ, took a pass on the unsettling pictures. The supermarket tabloid Globe has been noncommittal.